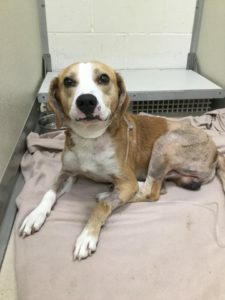 Jackson Update – A Reason to Believe Animal Rescue, Inc. When you take in dogs that have been hit by cars, or in Jackson’s case run over, you don’t know what you’re getting into. You can look at a dog and guess, but until you get X-rays and a few days pass you don’t know how it’s going to go. When you get into spine injuries, neuro deficits, etc., well it’s panic time. Those issues are life and death, long term nursing care, ups and downs. You have to think about what you’re signing up for, probably for the lifetime of the dog if there are incontinence issues, and decide if you’re willing to do it. When you get these dogs with traumatic injuries only time will tell sometimes what you actually have. It takes time for swelling around nerves to go down. By that time you’re a few days in with this dog and you’re committed to seeing it through… so when you have day after day set backs it’s devastating. I’ve been on a roller coaster of emotions over Jackson because of his pain level. If I couldn’t see the will to live, honestly I would have let him go. The last two days have been panic: all these narcotics and nothing, how will he get to OSU? How will I pay for OSU? Will he be incontinent? Will I have to catheterize him everyday of his life for him to pee? Will he walk again? All that worry to know that in the end no matter how much money or specialists, to know there may be no fix to the pain and I’d have to put down a dog that wanted to live… well it drowns me. When I heard from Dr. McNeal this morning, I cried. He has been trying to use the left leg. He’s gotten up willingly to go outside to pee. His urine stream is normal. He was able to squat. His pain is controlled and his appetite is back… all overnight. Read more of Jackson’s earlier updates here. Previous Post Jackson was hit by a car!